EMG and NCS tests are done in order to evaluate the condition of nerves and muscles. During the test there may be a very mild electrical stimulation applied to your extremities, and a very thin electrode-needle will be inserted into some of the muscles in order to observe their reactions. 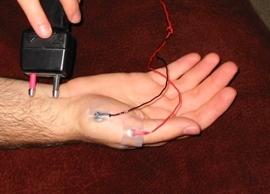 The test makes use of highly-sophisticated computerized equipment, which allows calculations of the rate at which your nerves conduct electrical impulses, and it assesses whether or not your muscles may have had some interruption in their nerve supply, or whether there is any damage in the muscles. This gives your doctor information about such disorders as injured nerve roots, damaged nerve and muscle disorders, which will allow a better understanding of your problem and provide for the best possible treatment. There is often some discomfort during the procedure, but it is usually mild, and you should feel free to ask for an explanation or a rest in between various parts of the study as it progresses. Generally, the complete examination requires an hour. El EMG y el NCS son pruebas que se hacen para medir la velocidad con la cual sus nervios conducen el impulso nervioso (similar a la conducción de la electricidad) y para medir la manera como sus músculos responden a cierto estímulo. 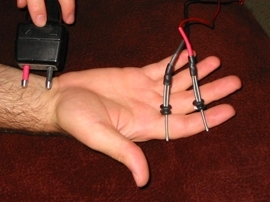 Durante la prueba se le insertará una aguja muy pequeña en algunos musculos a través de la cual se le aplicará una estímulo eléctrico de muy bajo voltage. Durante el examen, se utiliza un equipo de computación altamente sofisticado, el cual nos permite calcular la velocidad a la cual sus nervios conducen el impulso nervioso y determinar si existe algun daño en el músculo. Esta información ayudara a su médico a diagnosticar problemas, incluyendo lesiones en la raiz del nervio u otras abnormalidades tanto en los nervios como en los músculos, y de esta manera entender su problema y ofrecerle el mejor tratamiento posible. Usualmente, los pacientes sienten alguna molestia durante el examen, pero ésta es generalmente leve. Usted puede pedir que se le explique los que se le está haciendo durante el examen, e incluso que lo interrumpamos momentaneamente. El examen tiene una duración de 1 hora. Por favor, no use aceite, loción, crema o talco en la piel 24 horas antes del estudio. Sólo se permite el uso de desodorante. Limpiar la piel es indispensable. EMG Laboratory is a state-of-the-art facility that specializes in sophisticated electrodiagnostic testing of the nerves and muscles. Our goal is to provide the highest level of patient care and diagnostic support for our referring physicians. EMG Laboratory – Drasko Simovic, M.D., has been awarded the American Association of Neuromuscular & Electrodiagnostic Medicine Accreditation with Exemplary Status. Exemplary Status is the highest level of accreditation that an electrodiagnostic laboratory can achieve under the AANEM Accreditation Program. To be awarded Accreditation with Exemplary Status, physicians performing studies in the EMG Laboratory must meet the strict set of criteria and provide the highest level of quality in electrodiagnostic medicine. Dr. Simovic is Board Certified in Neurology, Electrodiagnostic Medicine, Clinical Neurophysiology and Disability Analysis. "This accreditation validates the quality of Dr. Simovic's work as superior," said Allan H. Ropper, M.D., Executive Vice Chairman, Department of Neurology, Brigham and Woman's Hospital, Harvard Medical School. "He's a dedicated and highly qualified specialist with a strong commitment to electrophysiology and to the patients he treats. He's thoughtful about how he conducts studies, tailors the study logically, and provides referring physicians diagnoses with certainty. Such certainty is important. It helps referring physicians make well-informed decisions about a clear course of patient treatment." We at EMG Laboratory are proud of our commitment to excellence and look forward to continuing to serve the patients and medical professionals of Merrimack Valley and Cape Cod and the Islands as we have since 1997.